Construction Is the most fundamental skill of any draftsman. In involves mastery of drawing simple two-dimensional and 3 dimensional objects. It also involves understanding the logical ways that these shapes interact within a 3 dimensional world. This includes understanding perspective, how to use multiple vanishing points and correctly constructing simple shapes in perspective. The laws of construction are finite and logical. You can really study all the rules within a relatively short amount of time. The real mastery of construction comes in the perfection of the skill. You can read in one sitting how to construct an ellipse in perspective, but it can take years to master drawing ellipses freehand. Construction should be practiced every day as part of your daily warm-up, and should really be how you approach any drawing task throughout the day. Design is the discipline of making your art look good. That's probably the most vague way to say it, but that's really what it's about. How do you make an image appealing? Or, how do you make an image effect someone in the ways that you want? There are a multitude of sub-skills within design: composition, proportion, focus, line-of-action, contrast and line quality, to name of few. The approaches to design are literally endless. Design is where creativity really comes into play. Rather than perfecting a skill, you are forever playing with possibilities. It's fun, but that doesn't mean that good design comes without effort. Mastering design requires constant study and experimentation. Design is perfected through study and application. Study involves in depth-analysis and copying of the works of other artists and carrying out exercises based on theory found on-line, in books or whilst chatting with an art-buddy, mentor or colleague. Application involves experimenting with your learning to prove and invent your own approaches. As the name implies, visual catalog means building a mental library of stuff you know how to draw. 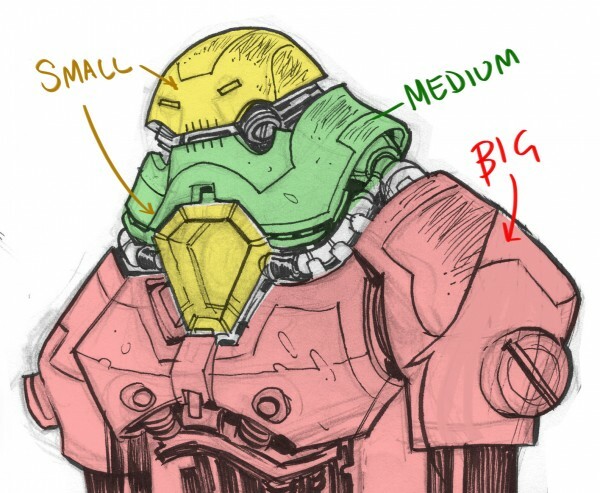 A skilled artist can draw anything from reference, but adding an object to your visual catalog will empower you to do far more stylistically with your drawings. For example, you may be able to draw a passable horse from reference, but an artist who has spent the time understanding the anatomy, structure and movement patterns of a horse can do far more when it comes to caricaturing or even quickly creating a layout from memory. What you put in your visual catalog is the fuel for your creativity. Once you have a deep understanding of how an object looks, you can mix and match it to construct your own inventions. If you want to use your art to do anything creative, constantly filling your visual catalog is a must. Common areas to add to your visual catalog are: human anatomy, animal anatomy, cars, architecture, landscapes, ect. The list goes on forever. What you decide to add to your visual catalog depends on what interests you (and maybe a bit on what pays the bills). Your visual catalog can be expanded through study and reinforced through application. A great way to asses your visual catalog is to do blind drawing (drawing an object without reference) and then checking it against reference. While the focus of my blog is primarily on draftsmanship, there are really two additional skills that apply if you wish to master painting as well. These are Renderingand Color. There are people out there far better suited than me to point you in the right direction, but as a start, I would recommend James Gurney's Color and Light. There you have it, as long as you keep in mind studying something from each of these categories regularly you'll see a constant improvement in your work. Personally, I like to do at least one exercise from each category once a week, but it's up to you to decide how to best to implement them in your personal study.